The FTSE 100, CAC and DAX opened up flat, but today promises to be far from quiet. Financial stocks led Wall Street to its worst one day drop in more than a month as influential US congressmen warned that the Treasury had not done enough to remove toxic assets from banks. As unwelcome as the sell off was, it has to be put in the context of the near 50% gains made since the March lows. At the height of the crisis a 1% down day would have been a quiet day. We have a busy day ahead of us today, starting with the important British employment figures at 08.30 GMT. Claimant count change is expected to rise from 23.8k to 25.5k while the unemployment rate is expected to rise marginally to 7.7%. The figures just released show a marginally worse picture coming in at 7.8% as unemployment reaches it’s highest level since 1995. At 09.30 GMT we get the Bank of England Inflation Report alongside a speech from Governor King which is likely to send shock waves through the GBP/USD. Over in North America, it also promises to be a busy session with the latest Trade balance figures released for Canada and the US at 12.30 GMT. Then at 18.15 GMT we get the event that many traders have been waiting for, the rate statement from the FOMC. Traders will be keen to learn if Bernanke and co will be following the Bank of England’s lead in expanding its Quantitative Easing activities. With so much activity already today, it would almost be easier to examine which pairs hadn’t moved much this morning. Essentially, Wednesday has seen an extension of the moves that started on Monday. Risk taking is becoming increasingly unpopular as traders shun high interest currencies such as the Aussie and New Zealand Dollar. The AUD/ JPY is down nearly 2% on the day. 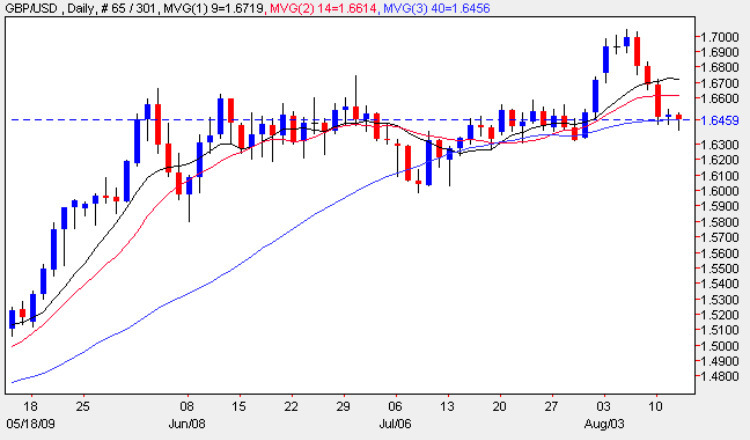 The yen is strong against the euro and the pound, with both the euro vs yen and pound vs yen both falling around 1%. Most currency pairs appear to be in play today, but the pound vs dollar hasn’t moved much in comparison to the yen pairs. This could all change with FOMC meeting at 18.15 GMT, with a breakout trade a potentially a good way of trading the pair today.